Amie Kaufman is the award-winning co-author of the Starbound series. Jay Kristoff is the award-winning author of the Lotus War series. They live in Melbourne, Australia. For more info: amiekaufman.com and jaykristoff.com. It is VERY hard to describe what I feel for this book, these authors and the Illuminae series because I AM A BROKEN SHELL that sympathises with a mass murdering artificial intelligence system (#WhatAreMorals?) and at the same time, I NEED 756320496 more stories from this world and no less because I’m a hungry bookdragon and I MUST BE FED. In non-rambling, simple terms, I AM IN LOVE WITH THIS SERIES. I hold Jay Kristoff and Amie Kaufman in the highest regard as (professional tormentors of hearts) authors and I will read ANYTHING they write. Let me (attempt) explaining my thoughts to you: 1. When Illuminae (Book 1) initially came out, I wasn’t sure WHAT to think. There was so much hype, and it left me jaded until the day I saw this AMAZING deal on Amazon and hit the buy button. I picked it up *months* later, after I got sent a Gemina ARC and HOLY WOW I WAS HOOKED TO THIS SERIES. It was intense, insane and nothing like ANY book I’d ever read before. Fifty pages into Illuminae, I knew I would need the then unnamed book three ASAP. 2. 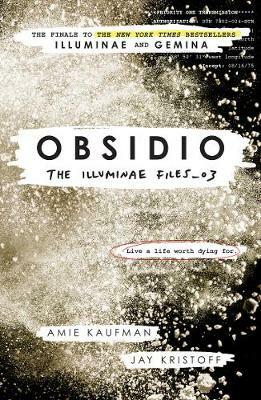 Obsidio was… heart-breakingly beautiful, filled with action, death, my favourite characters of all time and an artificial intelligence who, really, is one of my favourite parts of this series. There are so many elements and factors that come into play, with our eight favourite characters fighting for their lives and HOLY CRAP, Amie Kaufman and Jay Kristoff somehow managed to pull it off. 3. ALSO, AND I WILL REPEAT THIS UNTIL THE END OF TIME – I WAS KILLED OFF IN THIS BOOK. My name appears in the middle of page 100 (I was a Kerenza Resident) and I NEVER THOUGHT I’D BE SO HAPPY TO BE FICTIONALLY KILLED OFF. 4. I woke up, bright and fresh, last Sunday morning and read the last 223 pages in one shot. I had to stop so many times to BREATHE and PROCESS and CRY and shout in happiness and it took me two hours to properly read it, but I was crying at the end because I was happy, broken, relieved, shocked and most of all, AMAZED at everything these two geniuses have created. 5. I can’t say much more without spoiling the series, but I was SO HAPPY to re-meet Kady, Ezra, Hanna, Nik, Ella, AIDAN and the rest of the crew. There was mutiny, murder, rebellion, love, family, death, space, sarcasm and mass murdering artificial intelligences and HAVE YOU EVER REALLY ASKED FOR ANYTHING MORE? I can shout this for FOREVER – GO READ THE ILLUMINAE FILES. They’re nothing like anything you’ve EVER read before, and you will find yourself lost in the craziness of this world before you know it. ALL THE GLOWING STARS IN THE WORLD FOR THIS MIND-BLOWING SERIES. Can I have more books now, Amie and Jay?